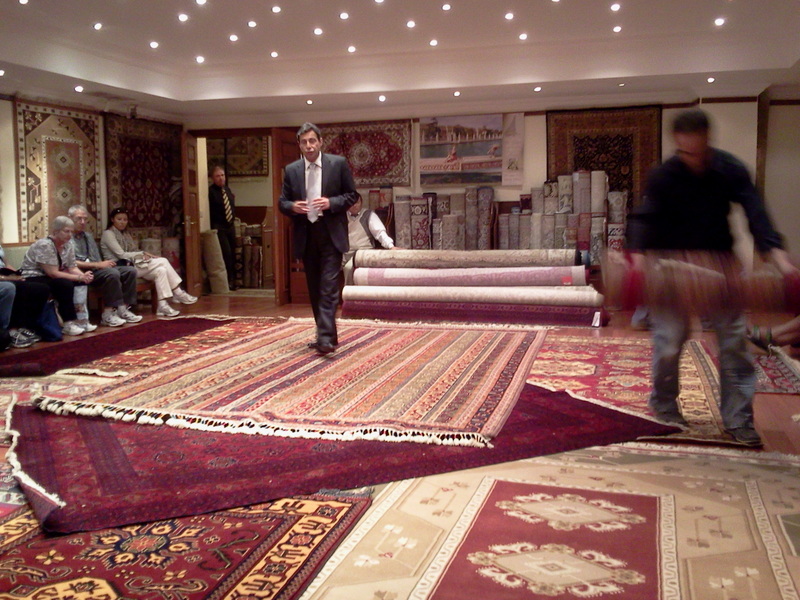 Last year, I went to see the real deal Rug Merchants in Turkey. The man on the left described the rugs, while the man on the right tossed them out, twirled them in the air, and sent them flying. Many of the beliefs that we hide under the rug were born in this part of the world, and and so it is quite fitting that the rugs have similar roots. My little sister was a real handful. If she didn’t want to obey my mother, she just pretended to do whatever my mother wanted and then hid any evidence to the contrary. She was a skinny child and so my mother bought her some tiny chewable vitamins probably thinking that she was malnourished. But my sister hated the taste of the vitamins. So she pretended to eat them. Then, after my mother left the room, she’d hide the vitamins under the rug. One day while cleaning, my mother found a year’s worth of tiny vitamins under the rug strategically placed so that no feet could detect their presence. Well to me that was a stupid question. Wasn’t it obvious? She hated the damn vitamins and felt powerless in her ability to persuade my mother to do what she wanted. When people feel powerless, they lie, they manipulate, and they develop whatever personality they need to get the job done. Whether our personality consists of the bully, the nice guy, the southern belle, the superman, or my one of my favorites, wonder woman, underneath it is powerlessness. We all have rugs that hide our vitamins. The bigger the personality, the more powerlessness we’ll find beneath the rug. Just like my sister’s vitamins, others usually don’t see the evidence of what we are hiding. They are too busy hiding their own vitamins. We only find the evidence if we happen to step on the right place and feel what is hidden or we discover the evidence while cleaning. We don’t usually deal with our own vitamins because we don’t see the vitamins once we hide them under the rug. It is usually someone else, an opponent (my mother in my sister’s case), that accidentally steps on our vitamins. Most of us either explode or lie when this happens. We aren’t happy about our stash of vitamins being discovered. Often we’re very embarrassed. After all, we didn’t hide the vitamins because we liked them. For the person wanting true mental freedom, the opponents who expose us are our heroes, our saviors, and our beloved ones. They help us to get honest; and honesty leads to mental freedom. We recognize that this person has done us a huge favor in playing the role of our enemy. They have shown us an aspect of our personality that we hid so long ago that we forgot it was there. Now that we are aware of it, we can let it go. Years ago, a friend invited me to speak at her house and made some bad choices in who to invite. After the event was over, she apologized to me. I said, “Oh don’t apologize. You did me a huge favor. I didn’t know I still had judgment for those types of people.” She was shocked. She said, “Never have I made such an embarrassing mistake and been thanked for it.” But the way back to freedom is 180 degrees from the illusory mental soup that most people marinate in every day. As we clean up our own mind by letting go of our hidden powerlessness, we slowly grow in power. Our false mind thinks that it has lost something because the false mind thinks competitively. It is like a hoarder; it thinks all that junk that makes up our personality has value. It thinks it will lose without its hidden stash of vitamins and its perfect mask. Yet, the opposite is true. This is where things get interesting in relationships. If one person in a relationship is letting go and the other is holding on to their personality, the freer one grows in power. Powerful people don’t fall for manipulation, lies, or tricks. They won’t buy crap that others want to sell them. They don’t make obedient slaves or possessed partners. They won’t take bad advice. They won’t hold down their brightness so you won’t feel jealous or bad about yourself. They tend to clean under the rug and expose vitamins; and if we see them as bad or wrong, we lose those who love us the most. As I chipped away at my vitamins, I noticed that I felt a strange guilt as if I was breaking some ancient code of honor among personalities that says, “I won’t expose your hidden vitamins if you don’t expose mine.” Following the code means that we ignore the elephants in the room and pretend that we are all lily-white. We pretend to be like the sun at noon that has no shadow. But relating this way lacks intimacy. We feel unseen and unheard. We feel misunderstood. It’s a lonely way of life. If we want to live from our authentic self, we have to clean out the vitamins and ditch the fake personality. Our vitamins are beliefs that we hold as true. We can find our beliefs by asking ourselves, “Why am I uncomfortable being myself with this person or in this situation?” “Why can’t I express myself?” “What do I think will happen if I speak my truth?” The answers are the legs that support all personalities. If we recognize that they are simply beliefs, not the truth, the legs collapse; we are now standing on solid ground. Most people believe that they will be judged for their shadow vitamins. Some see the person they are relating to as fragile or rigid rendering them unable to hear the truth. Some feel they will be misunderstood or unheard. Our complex of powerlessness is uniquely created by the influences of our authorities. But the complex is not real; it is simply a collection of beliefs. We see the manifestation of the beliefs and don’t realize that they are illusions created by our hidden vitamins. Many people try to take off the pretty part of the personality first, and that is like exposing an open wound. It’s ugly. What is hidden directly beneath the pretty part of our mask is the shadow of our positive false self. When we discover this, we avoid doing the work; we whip that mask right back on. Some people become authorities and project their shadow on to others. We tend to do what was done to us. But we are delaying the inevitable. Only if we keep digging through the wounds and beliefs will we find the True Self. A shadow projected out in the morning slowly comes back. For personalities, it is actually high noon when we realize that everything bad and negative that we blamed on others was our own projection. This is a humbling experience; but now that we’ve taken responsibility, we can let go. When we let go, we grow in authenticity and power. It is much wiser to remove the legs underneath the personality ourselves before someone else does it for us. It is no accident that we refer to personalities as magnetic. Beliefs create emotion, and emotion is magnetic. Personalities pull us into the illusory world of other people if we carry a complementary charge. The True Self isn’t magnetically charged. Our authentic Self is composed of unconditional love and compassion. It doesn’t have fear. So we don’t react to the hidden stash of other personalities when we are authentic. When we don’t fear them or react to them, we have the power to help them and to free them. You see, I actually knew about my sister’s vitamin stash, but it didn’t affect me. It was a game between her and my mother. Somehow that was easier to see in my youth. Our personalities react to other personalities; they are driven to fix the world and everyone in it. Personalities are wired to look out, not in. Personalities fight, they go to war, they compete, they fix others, and they project an illusory world of hell. Then they try to get everyone to play in their hellacious world. They are the leader that farts and then blames it on everyone else in the room. They see themselves as perfect; and everyone else is responsible for the mess that they pretend they didn’t create. It is hard to turn inward in the beginning. Most people live their lives like first responders. By the time the problem happens, it is too late. Action is needed and fast. But you can always clean out under the rug after fixing the problem at hand. Each time you do this, you expand your insight, you let go of some of that powerlessness, and you become more authentic. Eventually you see problems before they happen; and one day, you see no problems at all because there are no longer any vitamins under your rug. Cathy Eck, Ph.D. has researched ancient cultures and beliefs for over two decades. She shares the results of her work in her mentoring, workshops, and blogs https://gatewaytogold.com and http://nolabelsnolies.com.